hdm_retail has no other items for sale. Absolutely fantastic service. Highly recommend you. An ideal day bag, not to large, well padded, plenty of support fastenings, fantastic for the price. It also comes with a rain guard . You can carry a fair amount, but lest be honest, who wants to carry all their gear, a couple of lenses and camera is sufficient. Seems robust but for such a large backpack there is surprisingly little room for camera and lenses. The lower compartment for your gear is tiny and holds very little equipment. The main compartment is great for sundries but not for camera equipment. Also, the tripod straps are very small and won't hold a large tripod. Cheap and, I suppose, good value, but poorly designed and could have been so much better. Very quickly delivered goods. Bag is fully consistent with the description. 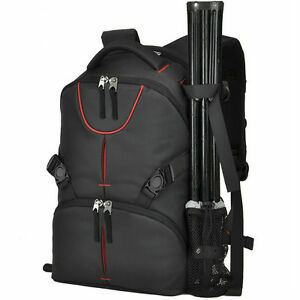 The capacity is sufficient for one or two cameras and two to four lenses. In the upper part you can pack a telephoto lens and flash. Enough space for small items. Holds are also 17-inch laptop. It is a worthy purchase for Photo Tour. Do not figured out yet how to attach the tripod. Backpack is very good. I could say -excellent. Only one thing, it's not very comfortable when you want in rush took out the camera. But maybe I just not used to it for now.